Getting into the investing habit can be a challenge, especially if you're finding it tough just to scrape up an extra $100. Once you see your investments grow, however, that rewarding feeling may propel you to seek out new, additional investments and continue to increase your nest egg over time. No amount is too small when it comes to investing, especially with the more recent advent of investment programs tailored to people who want to get started without having to save up thousands just to make an initial investment. The dollar-cost averaging concept has been around for a long while. The process involves purchasing a fixed-dollar amount of stock shares each month, such as a mutual fund, regardless of the current share price. While not all brokerage firms allow you to invest small amounts to start, many will and you could invest $25 per month for 4 months, to start your first $100 investment. You would hopefully continue purchasing shares each month with additional funds over time. As the mutual fund's share price moves up and down, you'll buy additional shares when the price is higher, and sometimes when it's lower, effectively averaging out your cost and reducing your risk level. While this does not guarantee that you won't lose your money, it does diversify your risk to a good degree. Also known as crowdlending, this investing concept is relatively new, and involves individuals lending their own money in the form of personal loans, to other individuals, with a non-bank finance company working as a middleman. Lending Club and Prosper represent two of the largest companies facilitating this kind of lending. You can start investing with as little as $25. The peer-to-peer lending company diversifies your investment by allowing a $25 maximum investment in any one personal loan. The more money you invest, the more loans the company spreads your investment across to minimize risk. From 2009 to 2014, Lending Club and Prosper experienced annual investment returns averaging from 5 percent to almost 10 percent. Maybe you want to invest $100, but you'd rather have it pulled out of your paycheck so you don't feel any pain. Keep your $100 cash for your emergency fund, and join your employer's 401(k) plan instead. Your money goes into the 401(k) account before paying any taxes, giving you more money to invest upfront. Each 401(k) plan typically has its own mutual funds from which you can choose to invest, and some may offer a broker for you to work with to help navigate your investment choices. You'll get a break on your taxes for any money you contribute into your 401(k), plus many companies match employee contributions either dollar-for-dollar or up to a certain percentage each year. You'll actually be investing more than $100 by the time you factor in the matching and the tax savings on the pre-tax dollars you've invested. 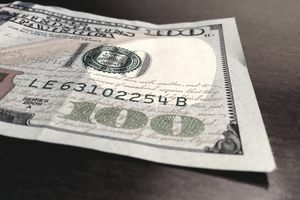 If you have $100 or less to invest, you might worry about choosing just the right investment to make sure you get a good return without losing your money. When you work with a brokerage firm and use the services of an investment manager, you pay a fee for their expertise. Robo-advisors present a new and popular alternative. These software-based investing systems buy and sell stocks for you using trading algorithms rather than human managers. In case you don't feel confident about your stock market knowledge, your robo-advisor will make investment decisions for you automatically depending on market conditions and other factors. The robo-advisor also reinvests any dividends automatically and rebalances your portfolio when needed to manage your risk level. Because robo-advisors are a fairly new development on the scene, they may still have a few kinks and not achieve consistent results. According to a market study, in 2016 investment brokerage Schwab's robo-advisor rewarded its investors with a 10.7 percent return, while Vanguard's achieved a 5.5 percent gain. For the same year, the Standard & Poor's 500 index achieved an almost 12 percent return. Fractional shares, essentially little slivers of a share of stock, make investing accessible to pretty much anyone. When you don't have the money to satisfy huge account minimums, consider buying yourself $100 of fractional shares. Often, when you try to open an investment account you'll find minimums of at least $2,000 and sometimes up to $20,000, just to be eligible to make your first investment. With fractional shares, if you would like to own stock in Amazon, Google or another company with an extremely high share price, you can do just that. Companies such as Betterment.com allow you to put in any amount of available cash you have into fractional shares of stock you choose, so you can get your money to start working for you immediately. While you could enjoy returns of 5 percent, 10 percent or even more on your investing strategies, in terms of real dollars these returns won't represent a whole lot of money yet because you're starting with less than $100 of investing capital. Read the fine print regarding any investment-related fees to make sure you don't give all your investment profits back to the brokerage company. Pay attention to any trading transaction fees. For each stock buy or sell, you could pay $4.95 to $9.95 per trade, depending on the company. Additionally, some companies may charge an annual investment fee of $50 or more. Certain mutual funds have what's called a load, essentially a commission or sales charge, so look for no-load mutual funds.